The Marriott New Orleans Hotel near the Convention Center is getting ready to welcome guests to the famous New Orleans Jazz & Heritage Festival taking place April 25-27 and May 1-4, 2008. This year, as in past years, there is scheduled to be an impressive lineup which will include: The Neville Brothers, Stevie Wonder, Billy Joel, Jimmy Buffett, Tim McGraw, Santana, Sheryl Crow, Al Green, Diana Krall, Keyshia Cole, Robert Plant and Alison Krauss, The Raconteurs, Irma Thomas and hundreds more are scheduled to appear. Along with all the musical guests, there are also a handful of distinctive craft and cultural venues, which will feature everything from African art to local handmade goods. In addition, the Louisiana Folklife Village and Native American Village will both highlight the music and traditions of the people of Louisiana and the state's indigenous people. A variety of food stands will be serving up delectable Louisiana comfort food. The New Orleans Marriott at the Convention Center knows that jazz's greatest city needs soulful accommodations to welcome festival guests. Historic New Orleans vacation accommodations complete with deluxe new bedding, flat screen TVs, plush bathrobes and trendy décor all enhance each guests experience and make them feel at home in the Big Easy. Visit nojazzfest.com for more information on Jazz Fest or to buy tickets. The New Orleans Marriott at the Convention Center delivers a legendary experience rich with historic elements. Located in the Warehouse/ Arts District, this New Orleans riverfront hotel is positioned across the street from the Convention Center and Port of New Orleans, as well as within walking distance to the French Quarter, Harrah's Casino, and the city s finest shopping and dining establishments. Housed in a former cotton mill from the mid-1800's, this riverfront hotel in New Orleans expertly combines classic antiques with modern amenities and trendy decor. Have your expectations exceeded when you make your New Orleans hotel reservation at Marriott New Orleans Convention Center Hotel. 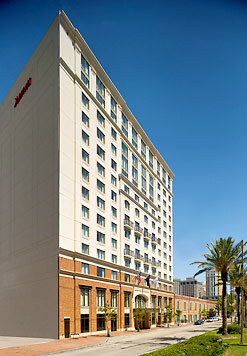 For more information or to make a reservation, call 504-613-2888 or visit http://www.marriott.com/hotels/travel/msymc-new-orleans-marriott-at-the-convention-center/.